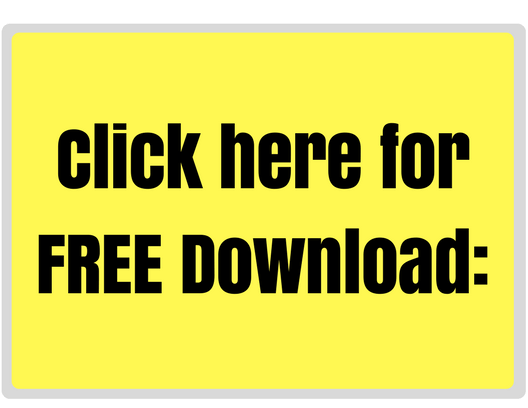 Inside: To encourage your kids to be kind, download these free printables with 60 kindness questions you can use to talk with your kids about how to be kinder people. As my daughter got in the car this afternoon after school, I asked her to tell me three things about her school day. After telling me about her art project and the book her teacher read her, she confided that at recess her friends were ganging up on Maggie again. I asked her how she handled it this time. She gave me a much different answer this time than she did last month. And thank goodness. Last month, my daughter joined in with the mean girls. She ran away with them giggling, leaving Maggie alone to play by herself. And I found a note my daughter wrote to Maggie on behalf of the others saying they wouldn’t be her friend anymore. Nope. That is not going to fly in our family. My daughter forgot that she is a kind girl. She forgot what it meant to be a good friend. So every day since then, we’ve discussed Maggie and what that must have felt like. We talked about ways my daughter could treat Maggie that would not make Maggie feel lonely or left out. And today, when presented with a big choice, my daughter nailed it. She said that when her friends were mean to Maggie, she wasn’t. She stood up for Maggie and played with her through recess. But this change didn’t happen overnight. Or by accident. We talked about what it means to be a good friend often. We talked about how to include Maggie in play so she feels welcomed and part of a group. 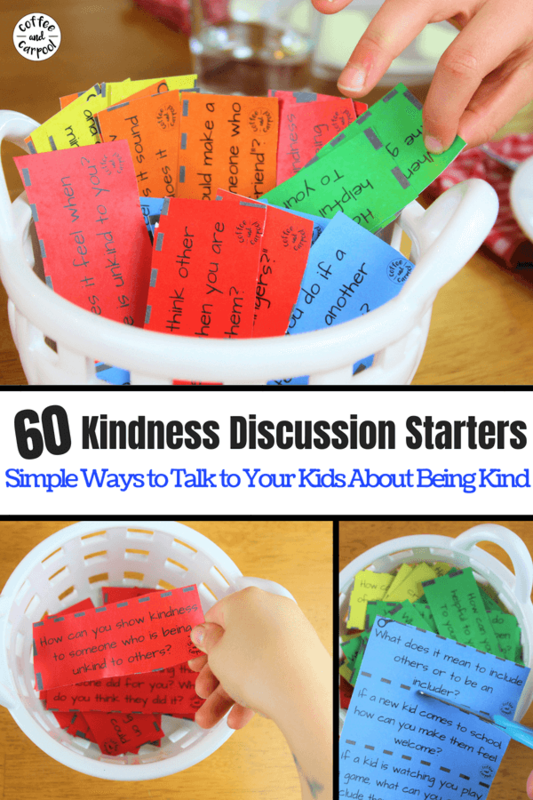 And we used these 60 kindness discussion starters during our dinner time to further our conversations. 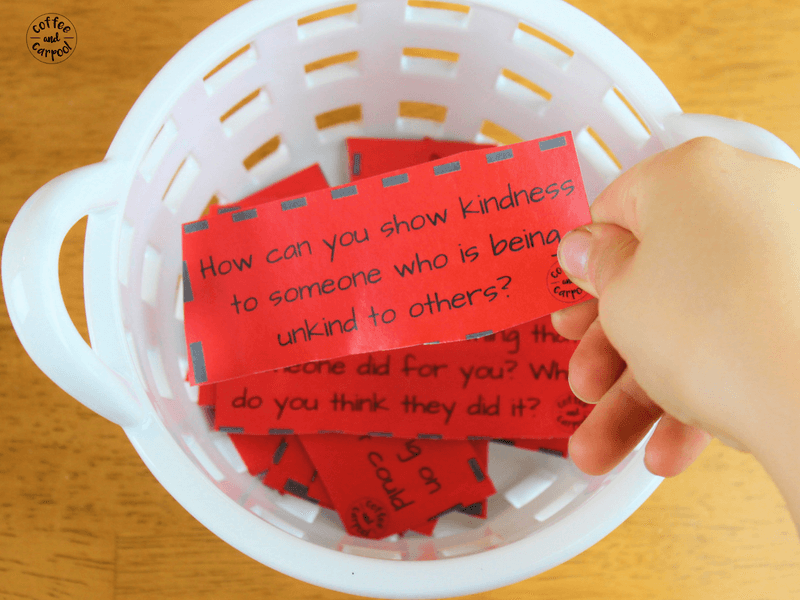 Why Do We Need These Kindness Discussion Cards? I have been on a mission for quite a while to raise kind kids. 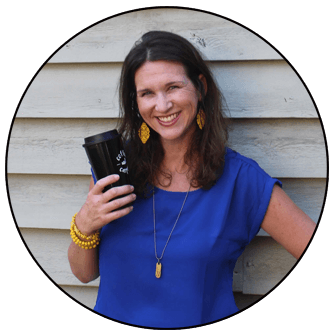 We talk about kindness often because being kind is one of our only 2 family rules. But as my kids are getting older and interacting with classmates and teammates, we’ve had to up our game at home. My daughter started showing signs of “mean girl” behavior at school. My son was on a baseball team where he was called a loser often and teased for not being a great ball player. And my eldest daughter is a hormonal tween who is trying to find her place and her way. And she’s trying to figure it out by yelling at me. A lot. We really needed to spend even more time talking about kindness. So I created 60 Kindness Discussion Cards we keep on our dining room table to talk about kindness often. 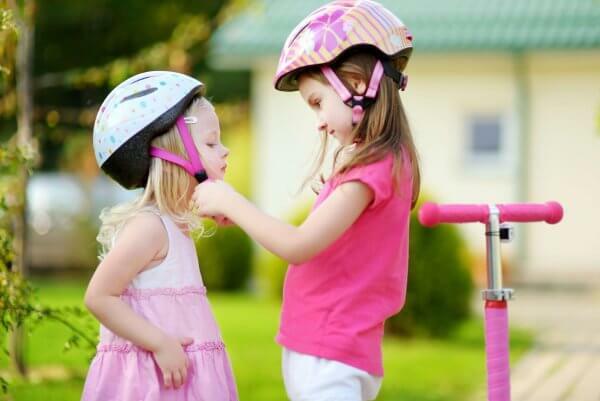 Being kind isn’t something simple to explain to our kids. Because it’s not one thing. It’s many things. It’s how you treat other people when no one is looking. It’s treating others the way you want to be treated. It’s doing something for someone without expecting something in return. So we need to ask our kids different kinds of questions and discuss different kinds of scenarios where they could be kind. Or where they could show more kindness. and being a good friend. 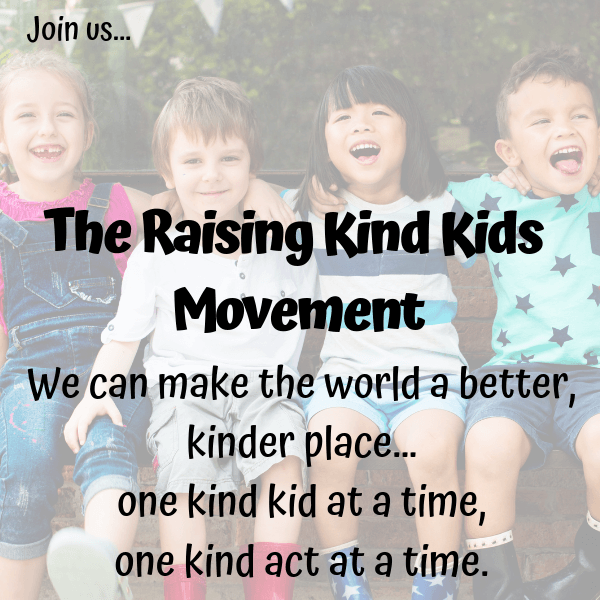 And when we talk to our kids about kindness and how we can show kindness to others, we are not only making our kids the best versions of themselves, we’re making the world a better place. Because kindness is contagious. One small act of kindness or one smile can ripple into other kind actions. 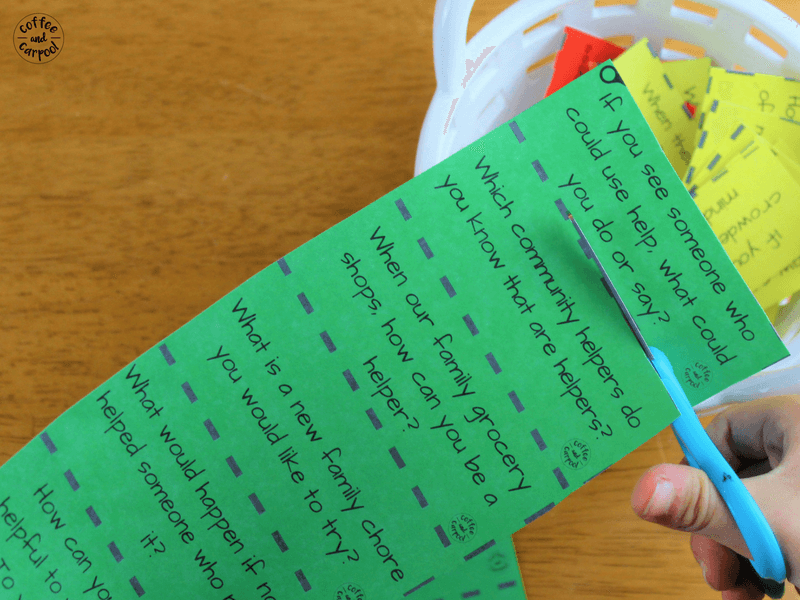 Want these awesome kindness questions to use with your kids? 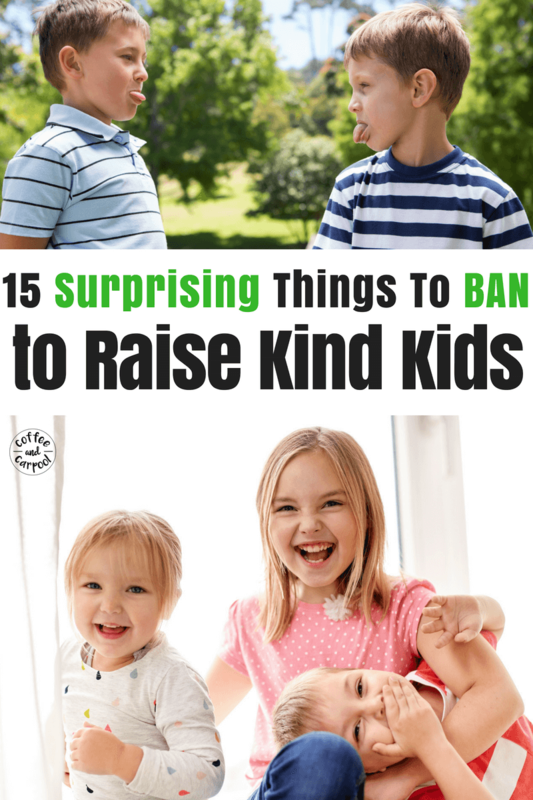 Download them here now by answering these three questions about Raising Kind Kids. 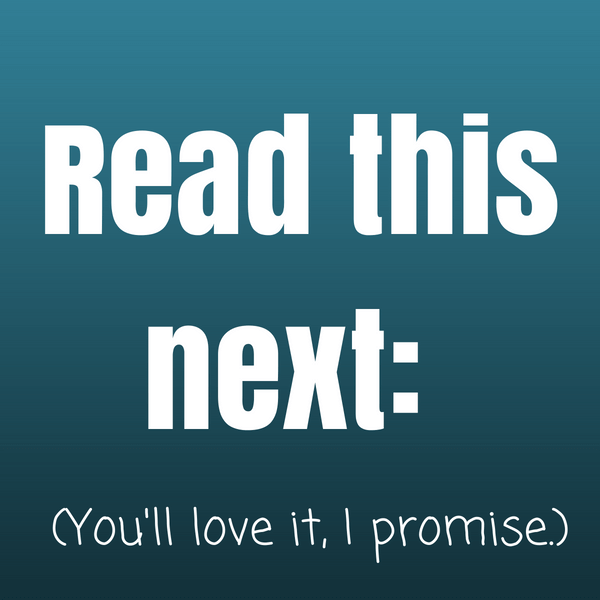 Print them on paper or cardstock. Cut them out or have your kids cut them. 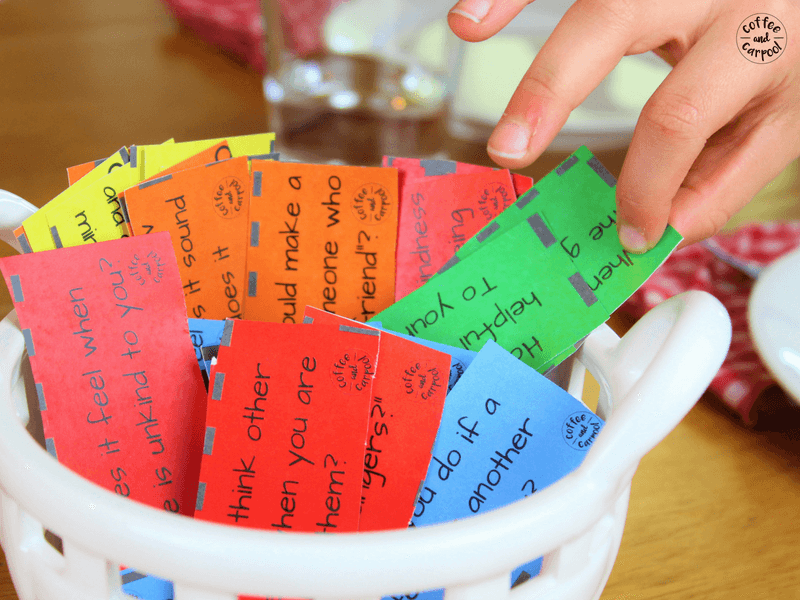 Place the questions in a jar or bowl and let your kids pick out a card or two each time you use them. The Red Cards are about kindness in general. 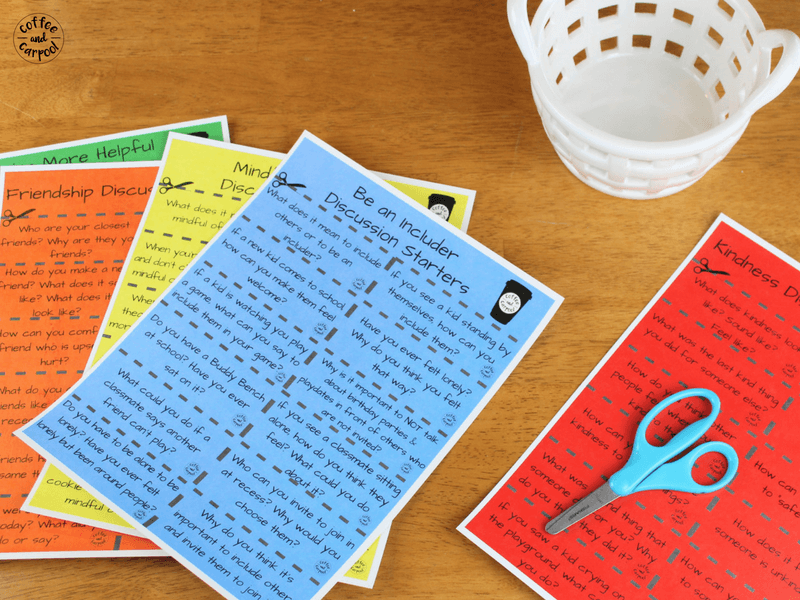 The Orange Cards focus on how to be a better friend. The Yellow Cards help our kids understand the importance of being mindful of others. The Green Cards target ways to be more helpful. And the Blue Cards talk about how to be an includer. All important discussions to help prevent my daughter from being a mean girl again. Teach kids how to say sorry! Place a buddy bench on playground for children who need a friend to play with. Use upper grade students as reading buddies. Yes! All fantastic ideas!!! I heart Buddy Benches when they’re used correctly! Teach kids to do a kind act just because it is a nice thing to do. Not as a thank you. This can be done by modeling in the classroom.